The one figure that instantly repelled me from the Avengers line was Hulk, before I went to see the movie. 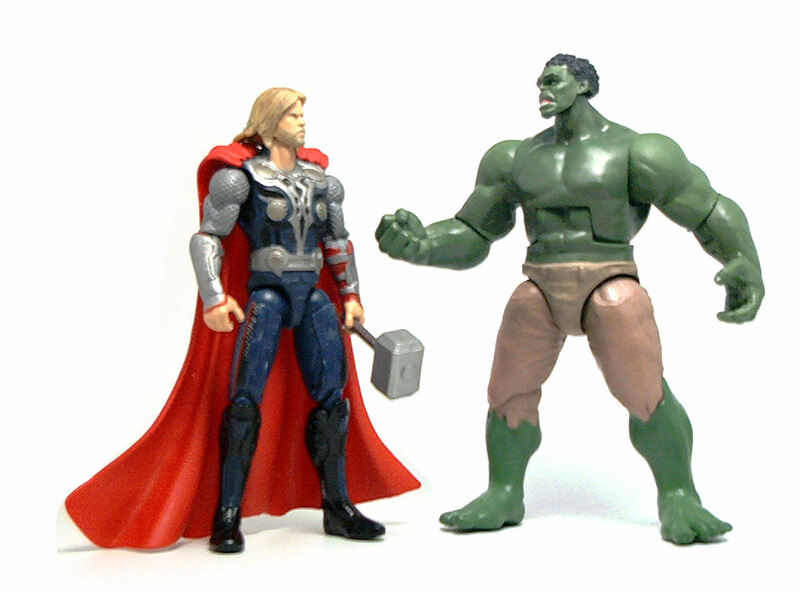 Afterwards, I started to have a change of heart because, after all, the Hulk rocks, but when I went back to the store, still undecided if I wanted the 4-inch scale version or the larger 8-inch version, there were no more Hulks whatsoever. 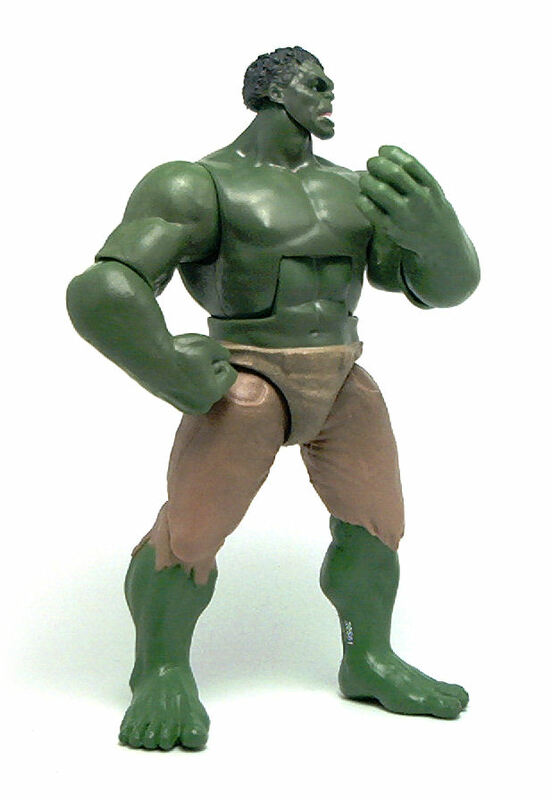 A few weeks (and another Avengers screening) later, stores put back out some more of these figures, so I finally got me the Gamma Smash Hulk from the Movie Series segment of the Hasbro’s Avengers toy line. The figure does have issues, and I am not referring just to the articulation (more on that in a few moments), but in the sculpting department. 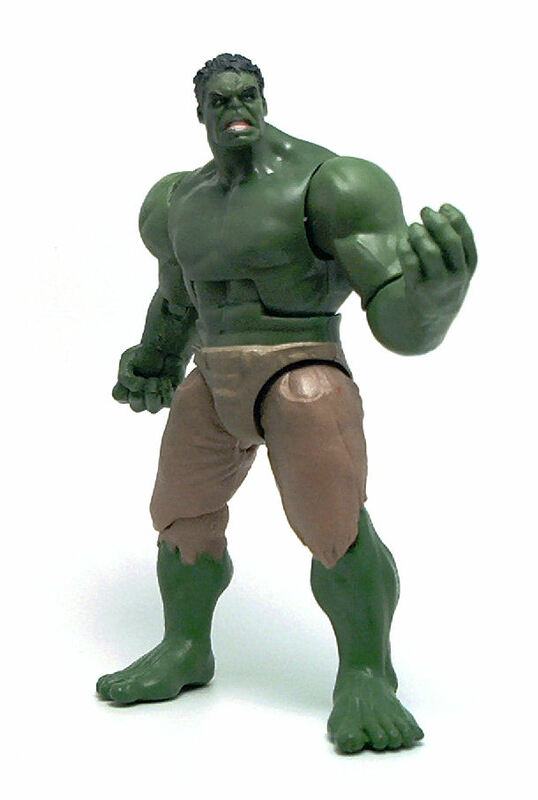 To begin with, this Hulk needed to be bigger to go along with the rest of the Avengers action figures. He is still the tallest, bulkiest of them, just not quite enough as he appears in the screen. Second, the sculpting is extremely bland. The body proportions do seem correct for the green goliath, but the sculpted detail on the body is so soft it almost feels unfinished. There is an attempt at texturing the pants, but it just isn’t very successful. The head sculpt, on the other hand, is quite good and does display a nice amount of personality, even though I would not go as far as saying that there is more than a passing resemblance to the digital model developed for the movie, based on the likeness of actor Mark Ruffalo. The end result is a sturdy, durable toy that is actually fun to mess around with. Something about it’s heft and the size of the joints make this Hulk into one of those rare items that qualify as “finger candy”, because it is very hard no to pick it up every few minutes to change his pose. The paint applications here are minimal, as most of the figure is simply molded in tan and green plastic. 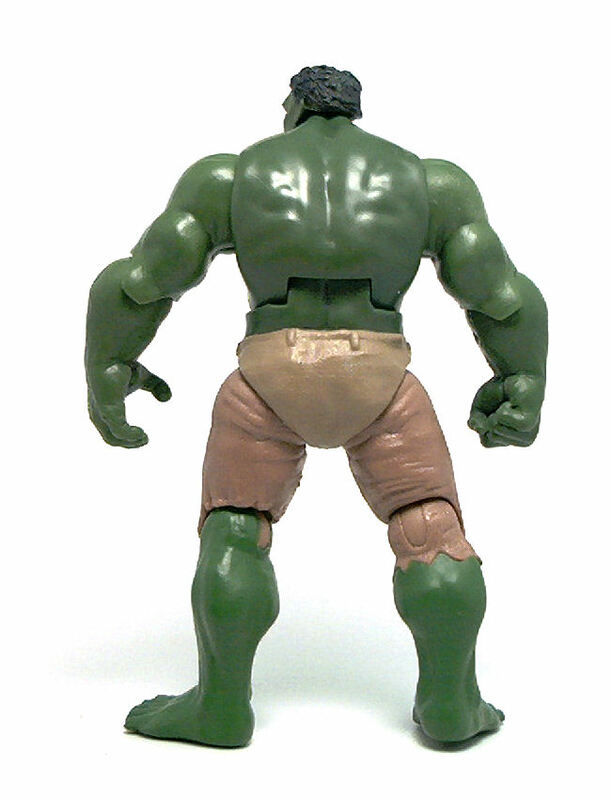 The torso, arms and head are molded in green with the “shorts” painted tan, while the legs are molded in tan plastic with green paint application to the lower legs. The face features brighter green irises on the eyes and also the inside of the mouth is painted. 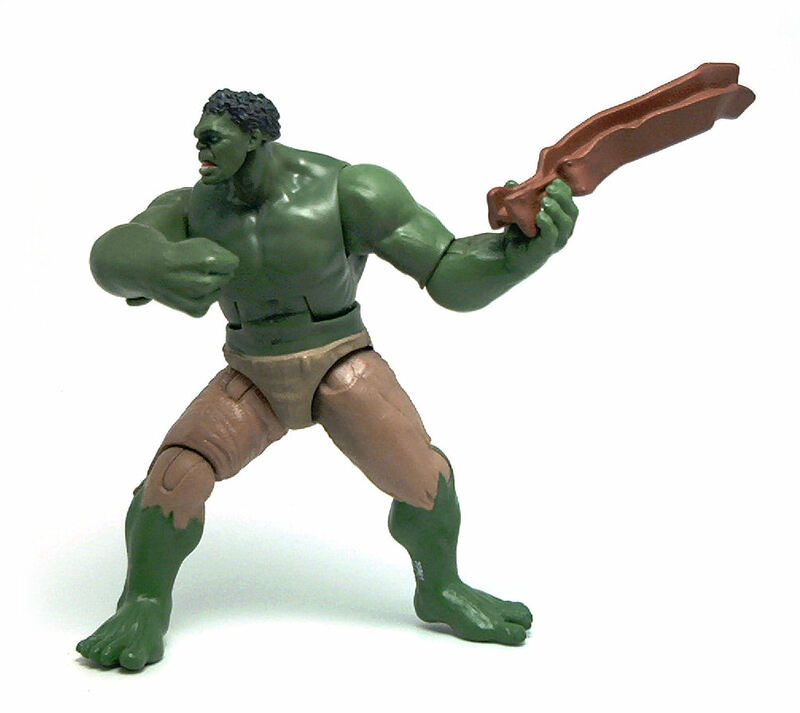 Even though Hulk has his left hand molded in a gripping pose, he comes with no accessories whatsoever. Instead, Hasbro gave him the Gamma Smash action feature. This consists on a spring-loaded spool inside the figure’s torso that causes the arms to spin forwards after pulling them back up and letting go. 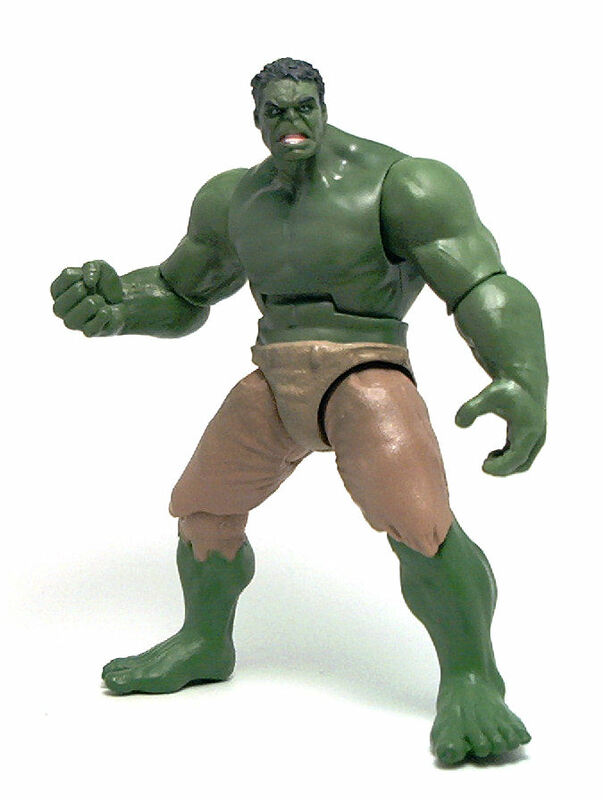 The weight of the arms is enough to also cause the torso hinge to snap forward, giving the impression of Hulk putting all of his weight into the blow. Despite being the weakest entry in the Avengers 4- inch figure line, Gamma Smash Hulk still makes for a very decent toy, in my opinion.